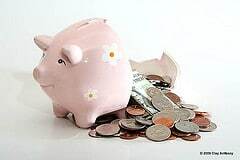 Parents Lending Money to Children – Good or Bad Idea? Lending money to family – especially your kids – is usually a very bad idea for both parties concerned. This is easy to say and hard to execute – I get it. None-the-less, let’s consider how very destructive this can be by reviewing a real life example. Terry and Nicole were retired and happy. They had plenty of income from pensions and investments. Life was good. No. Make that…life was great. young man and a skilled construction worker, but he found it difficult to move up in life. He longed to be his own boss but didn’t have the money to go into business — until his grandmother passed away. Charles inherited $300,000 from his dear granny. He missed his grandmother when she died. But when he got that check, he thought his dream had come true. He was in business — finally. He bought trucks. He bought tools. He hired salespeople and secretaries. He rented a large office, furnished and equipped it. He had a fantastic infrastructure in place. He opened his shop. It was slow for the first few months but then…it got even slower. The phone stopped ringing completely. Within a year, Charles burned through all the money that granny had left him. Now the story gets really ugly. Charles explained to his parents that the business would go under…unless someone would lend him money. Thinking they could salvage the company (and Charles’ inheritance), they started writing him checks and didn’t stop. $800,000 later, Terry and Nicole were broke too. In an effort to save the company and get their $800,000 back, they took out a second mortgage on their home. (I think they call this “doubling down” in Vegas.) Charles went through that too. In fact, Charles continued burning through cash and building up credit card debt. He even failed to make payroll tax payments and ran up a bill of over $125,000 to the government. Both Terry and Nicole were forced to leave retirement and go back to work. In the end, Granny’s gift of $300,000 ended up costing Terry and Nicole their retirement, their home and their peace of mind. It also cost Charles his condo and inheritance and landed him $175,000 in debt. Am I saying that your child is as talented at running a business into the ground as Charles? No. There are exceptions. If someone close to you wants to borrow money to go into business, let them borrow it from someone who is impartial. If your kids are forced to go this route, they’ll only get the money if the other party thinks the business is viable. If your children don’t have a good business plan, the universe will lovingly tell them “try again”. Maybe their ego will get bruised a bit – but their finances (and yours) stay intact. This is a better way to gauge if the business is sound or not. This will force the person who wants the loan to do their homework. Giving a loan to someone just because you love them could be like giving someone just enough rope to hang themselves. I know this is easy to write and that it’s tough to turn your kids down – especially when they are in a desperate situation. But if you lend money to anyone, you have to do it safely. And if you are going to “invest” in your kid’s business, only give them as much as you can afford to lose. Consider it a gift — and don’t expect to get it back. What has your experience been? Have you ever invested in your kid’s business? Have you ever taken a loan from your parents? How did it work out? Fortunately, I have woken up to this before it ruined me! I also inherited a decent sum from my father, and my three sons had the mistaken impression I was “loaded” and periodically pressed me for “help” – not loans, but that nebulous “help”. A couple of years ago I “helped” one of my sons out of his legal troubles with over $4000 which was, for me, a strain. This enabled him to get into the Navy and move his life ahead. Great news there, but in the ensuing years, as he’s earned money without expenses (military lifestyle on base), he’s traveled to visit his friends and now has purchased a Corvette. Has he paid back his mother? Not a dime. I’ve asked, I’ve suggested a monthly payment plan and, now that I’ve lost my job I’m asking him again for a monthly payment. I don’t expect to ever see this money again – a hard lesson learned. Thanks for sharing this. Of course I’m sorry you had this experience but I’m happy that at least you didn’t continue to “help”. Wishing better times ahead! I agree with Nate and Baker. Lending money to or from family can strain the relationship easily. Also, putting a family member into a business they have no reason to be in could be the worst possible course of action. I agree with Baker, borrowing is hard on relationships. Personally, I would rather borrow from a bank and pay high interest, that borrow from family and strain our relationships. I’m a big believer in the borrower is slave to the lender. Many people think they are actually helping family members they lend to, but more often than not they usually end up putting enough strain on the relationship to ruin it!